Brendan Rodgers has been appointed Leicester City's new manager after leaving his job at Celtic. "I'll give my life to make the supporters proud of their club," Rodgers said. Adding that he was "privileged and honoured" to take on the role, Rodgers said: "Together, we'll be stronger and I'm looking forward to working with the players, staff and supporters to make the right steps forward." Former Arsenal, Liverpool, Manchester City and Celtic defender Kolo Toure also joins Leicester as a first-team coach, having worked as a member of Rodgers' backroom staff at Celtic. "I'm absolutely delighted to bring a manager of Brendan's calibre to Leicester City," said club vice-chairman Aiyawatt Srivaddhanaprabha. "I look forward to seeing what he, our talented, young squad and our dedicated, skilled team of staff can achieve together." 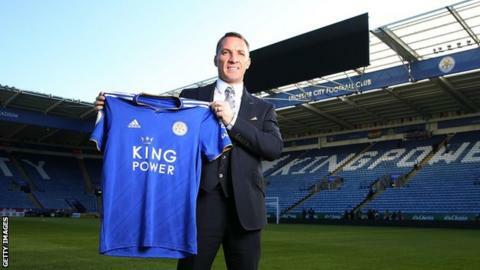 Rodgers will be Leicester's fourth permanent manager in 23 months after Puel, Craig Shakespeare and 2015-16 Premier League-winning manager Claudio Ranieri were all sacked. Saturday's 4-1 defeat by Crystal Palace meant Leicester had lost four consecutive home Premier League games for the first time since January 2000. They have conceded the first goal in 19 Premier League matches this season - more than any other side.